“Although Koczalski made a few acoustic discs and recorded in Poland after World War II, his main series of recordings was made in Germany in the late 1930s for Polydor. After his lessons with Mikuli, Koczalski had no other teacher, whereas Mikuli’s two other famous pupils who recorded, Moriz Rosenthal and Aleksander Michalowski, both studied with other masters; and it may be true to say that Koczalski’s recordings of Chopin are the closest we shall hear to the style the composer envisaged. He recorded much of the Polish composer’s output including the complete études, préludes and ballades, three of the impromptus, some nocturnes, polonaises and the b flat minor Scherzo. “Raoul von Koczalski’s recorded performances have been the topic of much discussion in recent years, especially among those involved in the field of historic performance practices, because of his particular pedagogical lineage. A ‘grand-pupil’ of Chopin, via his teacher Karol Mikuli, his lessons supposedly provided him with a connection to Chopin, and this has led to considerable speculation as to how closely his interpretations might resemble Chopin’s own. Koczalski’s extensive recorded legacy, with its strong emphasis on the works of Chopin, offers plenty of evidence for examination—but various ancillary factors must be kept in mind. 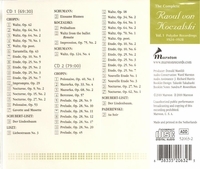 An examination of Koczalski’s pre-war recordings, representing about six hours’ total playing time, reveals several clearly-defined elements that help establish his approach to Chopin interpretation—supposedly as conveyed by the teaching of Mikuli….With only a couple of exceptions, Koczalski adheres to the notes of the score as published. This is remarkable only because of the practice of many of Koczalski’s contemporaries, who freely indulged in deviations such as bass octave doublings for greater sonority, reinforced endings (for example: interlocking octaves), extensions of passages beyond Chopin’s keyboard range, and so forth. The Chopin recordings of such noted players as Friedman, Moiséiwitsch, Rosenthal, Busoni, and numerous others all contain various emendations of this sort—often effective, to be sure, but a practice deliberately avoided by Koczalski. Beyond the actual notes, however, it is in the exploitation of both the rhythmic and dynamic spheres of a given work that a pianist’s margin of personal interpretation lies. Bearing in mind the multi-faceted nature of Chopin’s style which has inspired a tremendous diversity of approach among pianists, and acknowledging that we will never know what Chopin himself might have thought of this grand-pupil’s interpretations, the recorded contributions of Koczalski cannot be lightly dismissed, as they have in some quarters. Steeped in a profound, unquestionable dedication to their concept of Chopin’s musical ideals on the part of both Mikuli and Koczalski, these performances, whatever their occasional limitations, remain unique sonic documents deserving the serious attention of all pianists and scholars."